Of all the many statues of the Blessed Mother, Our Lady of Fatima has a special place in our family. She made herself present to us early in our marriage … before it began, really. 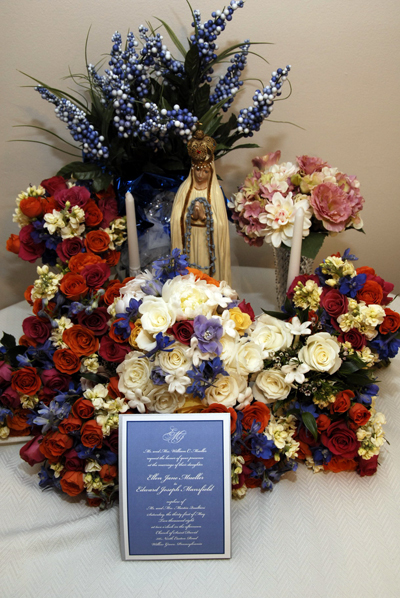 One of Ed’s sister-in-laws also has a devotion to Our Lady of Fatima and gave us a statue as an engagement present. On the day of our wedding, Ellen’s parents happened to be hosting the Pilgrim Virgin statue, which roams from home to home within a parish and is traditionally a statue of Our Lady of Fatima. Our photographer took several photos like the one you see at right, with our wedding invitation and the statue surrounded by our wedding bouquets. We had not asked him to take this photo, but it was a pleasant surprise when our wedding photos arrived and it was the first image we saw. Do you think from all this romantic talk that we’re newlyweds? Think again! We’ve been married for over six years and we’re about to welcome our third child into our family. Life is certainly full of highs and lows, like marriage, the birth of a child, the death of our parents and grandparents. Some days are just hectic, with two parents working and small children adding to our little circus. It really helps to have statues of the Blessed Mother, like the Our Lady of Fatima statue, in our bedroom or other religious pictures and symbols around the house. It gives just a moment of peace in a hectic day, when our prayers are rushed, the kids are cranky, and we look at the Blessed Mother’s sweet face and folded hands to know that she is praying for us. The Mansfield family lives in Plymouth Township, Montgomery County.